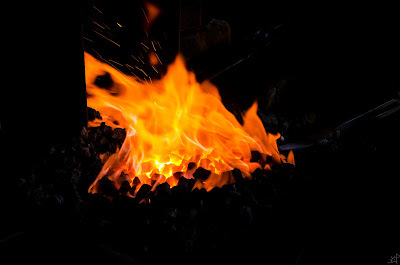 Forge welding, the process of using heat and force to fuse separate pieces of metal, is one of the fundamental joinery skills a blacksmith possesses which is unique to the trade. Unlike conventional welding, there is no filler material and the weld surface comprises the entirety of the area of overlap between the individual pieces. For many, this is a skill which seems elusive or intimidating, and for centuries there has been a shroud of mystery and ritual behind the process. 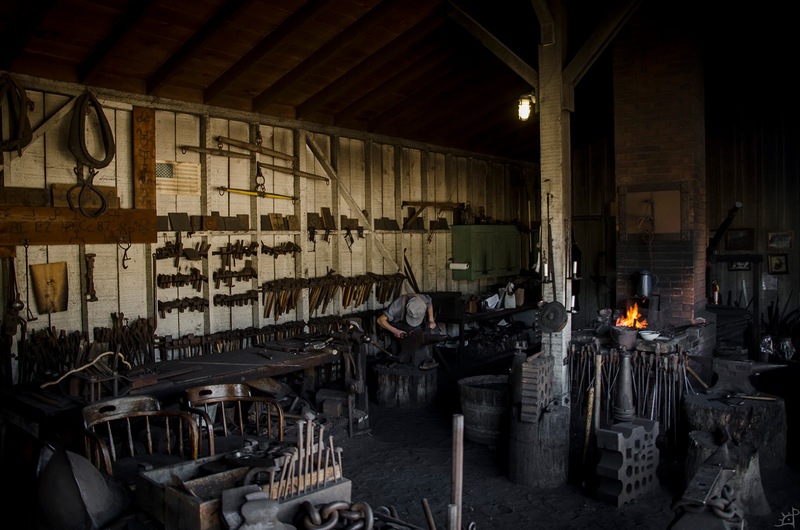 Once, blacksmiths were though as mystic for their ability to manipulate ferrous metals as they do, but with a bit of chemistry and patience, those corners of the trade become accessible to anyone interested in pursuing them. Of the reasons to forge weld, the most common is for pattern welding. However, forge welding can also be used as a means of mechanical joinery such as in axe heads where a high carbon steel bit is welded into a mild steel body. It can also be a means of refinery as is done in the consolidation of bloomery steel. Forge welding can be used to resize stock without bothering to upset it, and it can be a mechanism to achieve design geometry which is prohibitive with a single piece of stock. Whatever the reasons, the process will be explored here and common issues that I have encountered addressed. First and foremost, there are a few considerations which must be addressed. Surface preparation is, as I have found it to be, the most important factor in making a clean weld. How clean the steel is and the geometry of the surface together comprise a host of issues which can easily be addressed. Simply put, the cleaner the surfaces being welded, the better off you will be. Some tend to overdo it a bit by grinding free of any scale, stacking the steel, and using alcohol to remove any contamination from the surface. Various substances can be used to prevent oxidation or contamination or any number of things, which theoretically can help you, but I have never had to resort to that to weld steel. Whether in solid fuel or gas, the process is effectively the same. The only difference is in a gas forge, the process is easier to observe. Having welded extensively in both, it comes down to what you are familiar with, what you have available, and which you ultimately prefer. For the time being, I am confined to 1850s technology, which means solid fuel. Lately, I have come to prefer solid fuel forges for their ability to localise heat, control over temperature, and the romantic appeal of using an enormous pair of bellows to conduct my work. 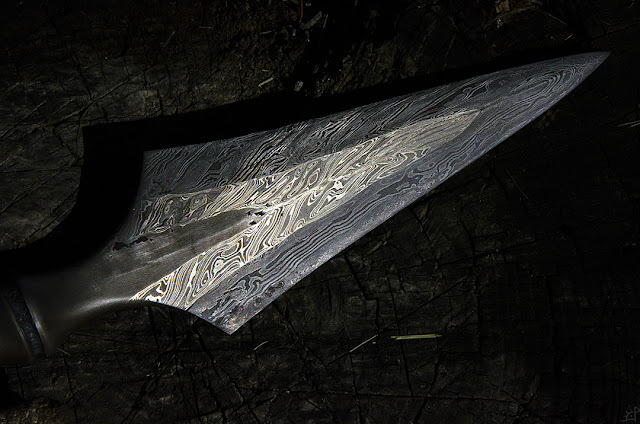 From here on out, I will be addressing the forge welding process through pattern welding and my bladesmithing background. These processes apply the same regardless of what steel and shape you are welding. Above, I have a billet of 5 layers. The core is 1075, with a thin jacket of 15n20, and outer cladding of wrought iron. This is a prime example of how different steels move at different rates. The wrought iron will move much faster under the hammer than the 1075, not only because it is on the outside and experiences a more direct application of force from the hammer, but also because of its relative plasticity. Wrought iron tends to move faster than carbon steel, same as mild steel moves faster than high alloy steel. Knowing what you are working with will help predict how to treat the billet once it is welded. Preparing a billet to weld comes down to a few things. Taking it simply, having clean flat surfaces is enough. In an ideal situation, having the mating surfaces be slightly convex aids in ejecting slag and scale when you set the weld, preventing it from becoming trapped inside the weld and fouling its integrity. Assembling the billet is another question that many people have. Since wire feed and stick welders did not exist in the era in which I am working, there are a few alternatives. First, I will address modern welding equipment. Many people prefer to tack weld the billet together before welding. This holds all the layers together and allows you to handle it without fear of it falling apart before the weld is set. If you have a welder available, great. Usually, both ends are welded with a bead down the corners, and another bead down the middle of the billet on each side. If you do not do the one in the middle, the expansion of the steel as it heats in the forge will probably tear the welds at one or both ends. I do not like to weld down the middle because it has a chance of introducing that filler material into the pattern of the steel if you do not grind it out later, so if I do tack the billet together, I only do so at one end. This allows the steel to expand however it wants without breaking the thing that holds it all together. 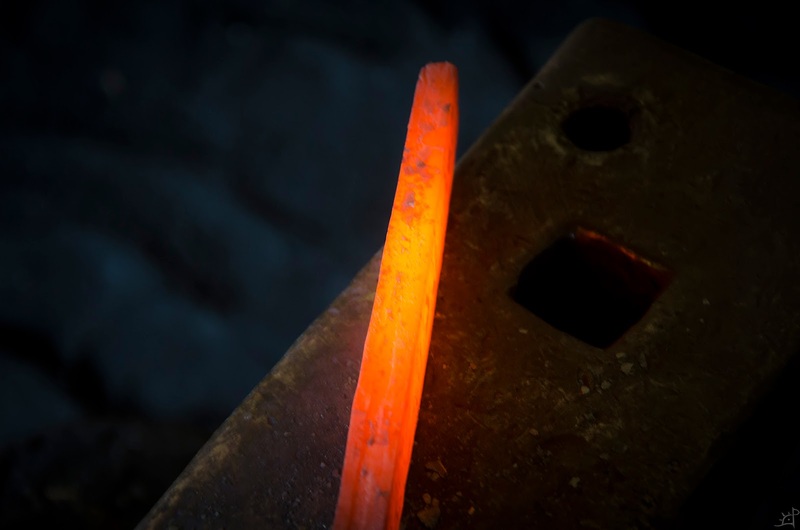 Depending on the size of the billet, many prefer to weld a sacrificial handle to it. If you have decent welding skills, that is fine, but if not, I would skip that step. 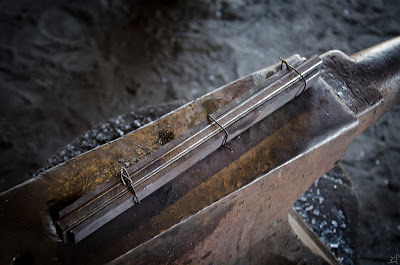 The best tongs are simply having a piece of stock long enough to hold onto without tongs, so handles can be great, but I have never had one survive an entire forge welding operation. For that reason, I forego the handle and just use tongs. This also allows me to pinch the layers together in the forge, which can actually be enough to set the weld without a hammer. If you do not have a welder, wrapping the billet with non galvanised wire can do the trick. For the better part of my journey I have done this and rarely had a problem. While it requires a bit more care in the handling of the billet, the results are clean and ultimately the same. 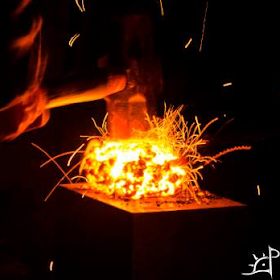 Once you have your billet of steel ready for forging, the real experience begins. There has been quite a bit of discussion lately about welding without flux, and I will not be addressing that here. For the purpose of learning to forge weld, flux gives you a few key indications of what to do. Before getting into that, I will discuss the flux itself. Across the ages and continents, there have been a wide variety of fluxes, but in the modern era the easiest and most foolproof that I have found is to simply use borax. 20 Mule Team borax is found in just about any supermarket and does a great job. If you are struggling with a particularly stubborn weld, I have found that adding coal or charcoal dust and iron or cast iron filings to the mix helps considerably. The exact ratio is not all that important, but it should be mostly borax. Beware that the more iron filings added, the more you will see it in the weld lines later. Cast iron or iron filings will help cement the weld because the surface area to volume ratio is much higher than that of the billet itself, so it will melt earlier, acting as a sort of metal velcro to the weld. However, because the carbon content is radically different than the steel in the billet, it will muddy the weld lines. For pattern welding, this is working against you. 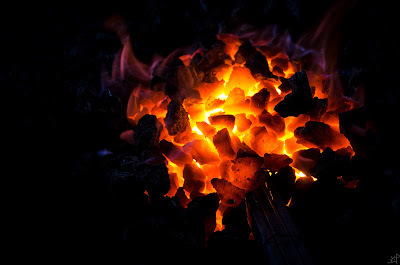 The coal or charcoal dust will consume the excess oxygen that makes it into the weld surfaces and prevent scale buildup. As the steel heats in the forge, oxygen attacks the surface of the steel, forming scale, which is the natural nemesis to welding. In order to prevent that, flux coats the surface with a barrier which prevents oxygen from reaching the steel. When welding, I generally do the following. 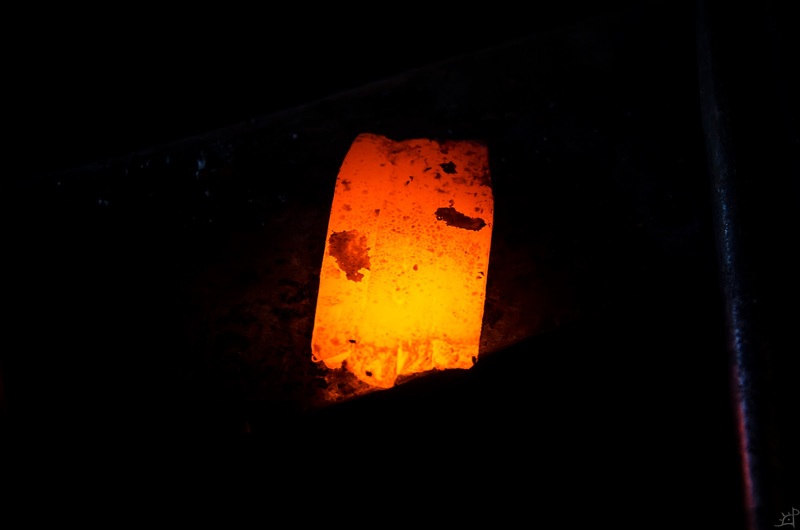 The billet goes into the forge, and when it reaches a dull red temperature, I add a light coating of flux along the edges of the billet so capillary action draws it into the mating surfaces. After that, it goes back into the forge until a bright orange. Then it's more flux and back into the forge until it reaches a welding heat. To say that there is one single welding temperature is to assume that all steel is equal (which it is not!). 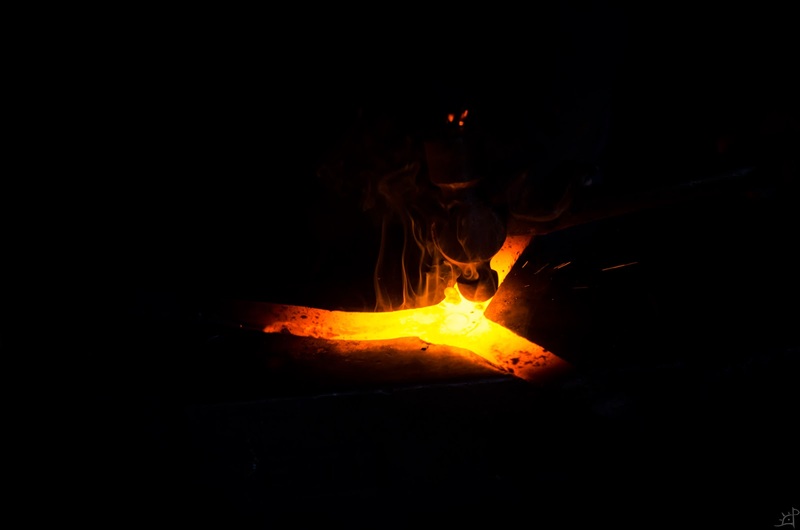 With the flux on the steel, the first visual indication that you are in the right range for forge welding is that it will be bubbling and dancing along the surface of the steel. 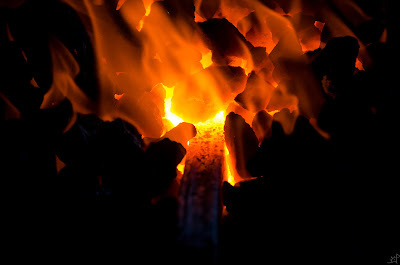 This is much easier to see in a propane forge, as it is not covered in coal or coke. The next indication is the vaporous smoke that comes off of the billet from the borax when it is at welding temperature. In the above picture, you can see the wisps of smoke coming off the steel. In person, this indication is very distinct and easy to recognise regardless of the lighting conditions. Setting a weld may seem like a thing you need to do by hitting the steel as hard as you can, but in reality it is just the opposite. Setting welds is best done with gentle taps in the beginning. Due to the difference in movement of the various steels used, heavy amounts of force will rip the welds apart. In a propane forge, I often set the welds simply by pinching the billet with a pair of tongs, never even taking it out. 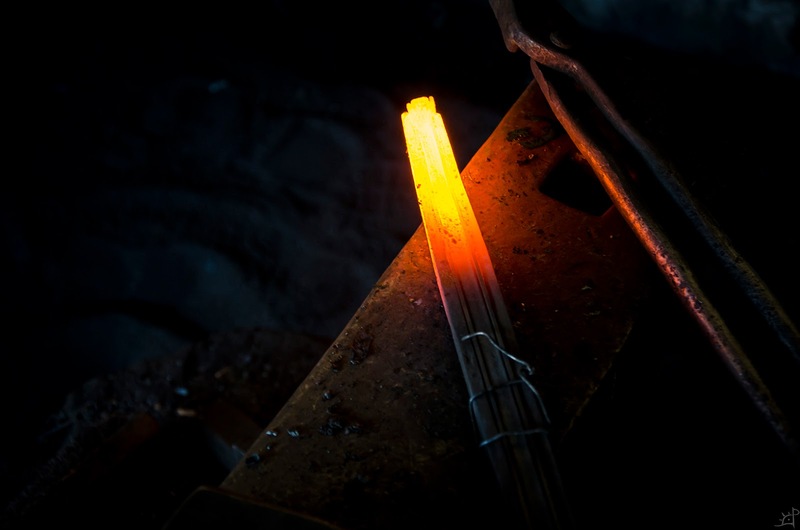 Depending on what you are welding, there is a decent chance that the billet's length may exceed the length of a heat you are able to achieve. Above, the billet is considerably longer than what I am able to weld in one pass, but that is no problem at all. As long as you only forge the sections that are at welding heat, you can forge weld any length you are able to hold onto. 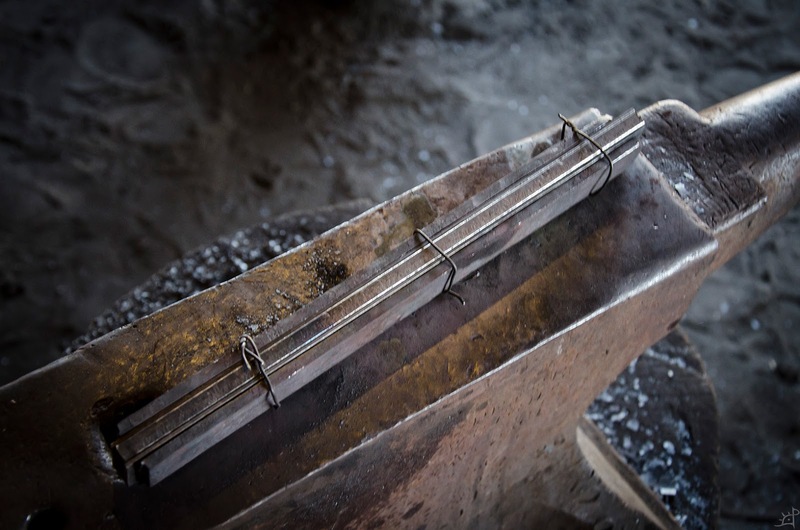 In the case where you need to weld in sections, move gradually back along the length of the billet, using overlapping heats to move the weld towards the unwelded section. As tempting as it may be to forge the billet everywhere along its length where it is at welding temperature, being methodical is the best way to avoid trapping any scale inside. 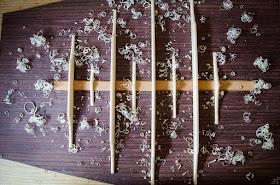 I always start at one end, working towards the tongs or handle, starting in the middle of the billet's width. From there, move towards the edges first, until the entire end is firmly welded. Then, move back towards the unwelded end, staying in the middle. This gives the flux and scale a chance to evacuate the billet as you work outwards towards the edges. While temperature is obviously an important factor in welding, the indications given by the flux are not enough to guarantee the weld. As you work, there are a few key indications which will tell you if the weld has taken. The easiest and most destructive is to hammer the weld on edge. If it is solid, the layers will not delaminate. Doing this is sometimes necessary to accommodate the geometry of the final object, but doing so before the weld has matured can still cause weld failure even if the billet was solid. Next is how the scale forms. A solid weld will form scale on the surface that is unbroken across the layers. Where layers are not welded, the steel's grains will not be fused, and the scale cannot physically form across that line. If you have an edge which looks flat but does not form a continuous piece of scale, there is a weld flaw in there somewhere. This may not be the best indication however, as sometimes you do not have a billet where the layers are exactly aligned or precisely the same width. Outside of pattern welding, there are often sharp corners meeting flats, which can be difficult to blend perfectly on the surface. Also, with differential expansion rates, you may be deceived by the scale formation if one layer mushrooms out from the others. As you can see, across a solid weld the scale will be continuous. Above, the difference in nickel content of the layers gives the pattern to the steel as well as the scale. Those flakes are connected across the weld lines regardless of the alloy because that weld is solid. If the formation of scale is proving elusive or indecisive, the next thing I look for is cold spots. Where there is a bubble or an incomplete weld in one of the layers, the two sides of that weld flaw will cool at different rates. Shadows on the steel are a fairly conclusive sign of an incomplete weld. If the billet is completely welded, it will cool at a uniform rate. 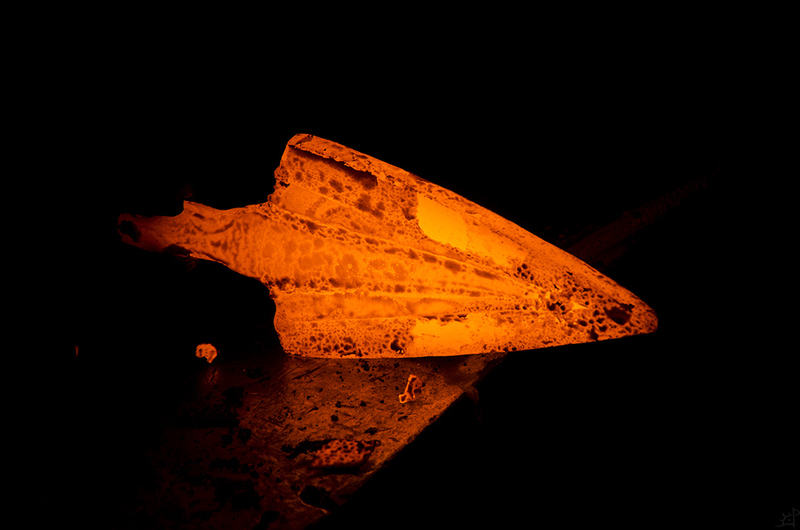 Lying the steel on the face of the anvil or somewhere where it can cool fairly quickly, it is easy to notice. More often than not, I find bits along the edges of welds that are not fully set, and addressing those individually provides a means to fully weld a billet without overly distorting the entire thing. If there is a flaw in the middle of a billet that does not cross to the edges somewhere, sometimes spot forging it will not work. Either trapped air or flux or scale or whatever does not have a chance to escape, so the surfaces cannot ever perfectly mate. Grinding through that bubble may be necessary, but you might also be able to drill or punch a small hole through it which allows whatever is trapped inside to evacuate the void. As the weld matures, the steel can be worked at gradually lower temperatures. In the beginning, I work solely at welding temperatures to ensure that it is fully set, hammering only down in a direction which pushes the layers of steel together. When I am confident that it has taken, I move to addressing the shape of what it will ultimately become. Forging down the weld lines is, as said above, a good indication of if everything has cemented fully. Unless I am using a press or power hammer, there will generally be a little bit of need to forge across the welds in order to dress the billet. Above, I welded a composite billet of an opposing twist core and 5 layer edges on either side, and because I had neither a welder nor wire to hold it together, I simply held onto it with a pair of tongs while it approached welding temperature. The rough forged dimensions were not exact between the core and edges, so there was a need to hammer across the welds to achieve a flat surface. While situationally dependent, there should be little reservation about forging across welds as long as you are hot enough and certain the welds are set. Forge welding is, as I see it, an incredible process which should be seen as an opportunity to enhance the craft. The limitations of its potential are non existent so long as the beginning trepidation is overcome. While there are certain chemical barriers to what can be welded, the majority of weld failures can be easily avoided given a bit of education and practical experience. Regardless of what you begin with, the dimensions or the surface conditions, the grades of steel or the ultimate design, persistence can overcome the material limitations given the right conditions. 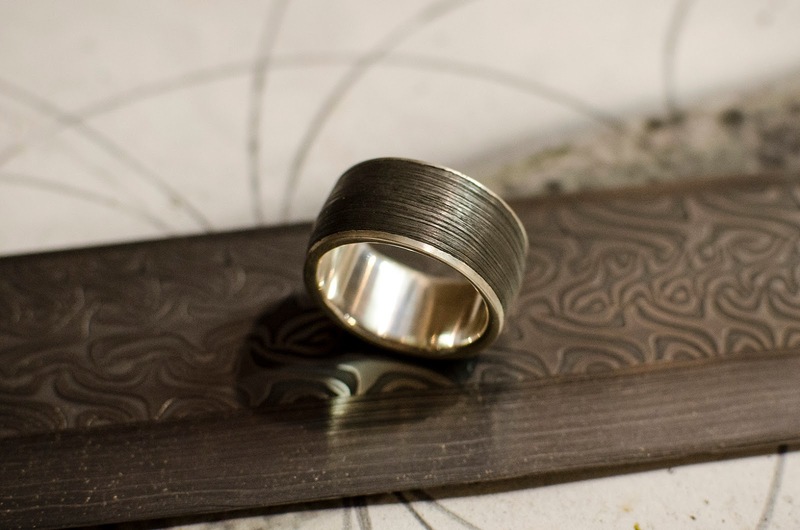 Whether from a pile of scrap tack welded together, a rusty spring found buried in the middle of the woods, or a pristine billet prepared from modern steel, forge welding is limited only by the imagination and the constraint of design. Patterns can be manipulated by hammering or by grinding or any number of mechanisms to produce results both rooted firmly in the history of the craft or never done before. It is, as many things have come to be, a process which can only be truly achieved by doing. And the only to know is to try. An inspiring story! - I'll have to keep at it. - Thanks for the excellent information and advice.